Santa got some help delivering gifts and food from DART Police at the Southwest Center Mall in Dallas this year. 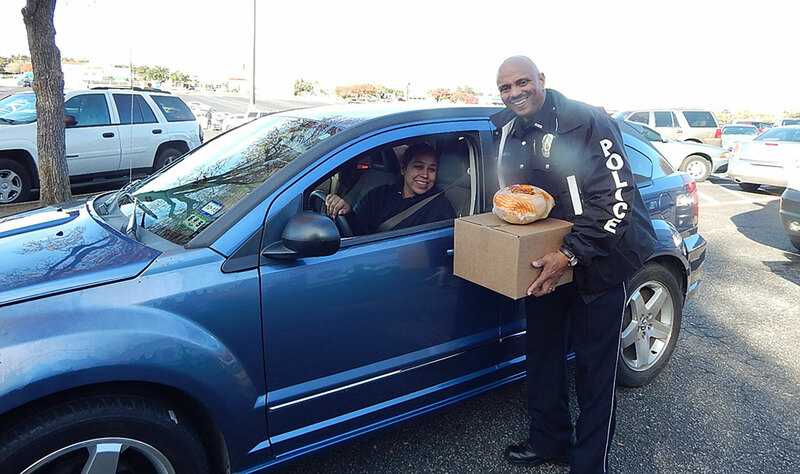 Through their annual Santa Cops program DART police and more than 200 others volunteered to distribute collected donations to approximately 250 DART service area families on Saturday, Dec. 5. DART police expanded its Santa Cops outreach efforts this year to help accommodate more than 5,000 area families with Christmas toys and food. The new partnership includes the YMCA, Southwest Center Mall, Oak Cliff Bible Fellowship, Antioch Fellowship and Concord Church. Dallas Area Rapid Transit (DART) gets you around 13 cities with rail, bus, paratransit, and rideshare services. We serve DFW International Airport and Fort Worth via the Trinity Railway Express (TRE). The service area consists of 13 cities: Addison, Carrollton, Cockrell Hill, Dallas, Farmers Branch, Garland, Glenn Heights, Highland Park, Irving, Plano, Richardson, Rowlett and University Park. This entry was posted in DART Events. Bookmark the permalink. Mon. - Fri.: 6 a.m. to 8 p.m. Sat. & Sun. : 8 a.m. to 5 p.m.